In 1963 powered surf rescue craft began in New South Wales when a team from Newport Surf Club in the Manly Warringah branch, comprising Bert King, O.A.M, Peter Dawson, O.A.M., Jack Hopper and Peter Liddle became interested in the idea of having motorized surf craft to do rescue work. After they made enquiries they found out that the U.S. Coastguard had a craft designed and built for rescue in rough water and bar situations. This craft was called a ‘Bartender’, a double ended open sea boat with an inboard/outboard motor set through the hull. They purchased one and it immediately proved a success. 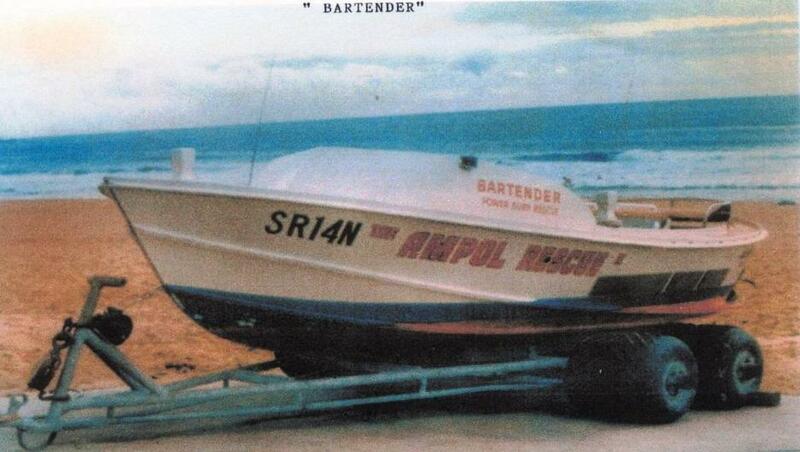 They found a sponsor in the Ampol Petrol Company and the craft was named ‘Ampol 1’. They began operations at the local and nearby beaches. Radio communications was in the hands of Peter Liddle in the form an FM radio mounted both in the boat and the towing vehicle. Peter Liddle was to continue the design and development of radio, not only in rescue craft but also in all surf clubs, right through to the later waterproof radios installed in IRB’s today. In 1965, Don Matheson B.E.M. from the Freshwater Surf Club (figure 2) got a group together comprising Bill Gustofsen - boat builder, John Smith - Engineer, Bob Macpherson - South Curl Curl and Kevin Aldridge - North Curl Curl. They deliberated on the design of a ‘Jet Powered Surf Boat’. It finally evolved as a fibreglass 16 foot clinker hull with a Ford motor and a Jacuzzi jet unit. The craft was built and then launched on the 22nd January, 1967. It was sponsored by the Harbord Diggers R.S.L. Club. It came under the control of the three surf clubs – Freshwater, North Curl Curl and South Curl Curl and was crewed by members from the three clubs. The Group took on the name of “Jack Wilson” after a prominent local identity. John Thompson was the first Captain and retained that position for seven years and they commenced rostered patrols straight away. This was to be the first jet powered surf boat in Australia. 2: Don Matheson B.E.M. Freshwater S.L.S.C. Communications was by means of an FM radio in the boat, linked up with a local tow truck firm at Artarmon, who were on the air 24 hours a day. This gave the group access to a radio at any time of the day or night. Later, Sir Adrian Curlewis, who needs no introduction, became ‘Patron’ of the Wilson Group. In figure 3, the Judge can be seen testing out the jet boat for himself with the help of Don Matheson. 3: The Jack Wilson I (El Sin) hits the beach for the last time (sigh), Sir Adrian Curlewis with the indomitable Don 'Matho' Matheson. Life jackets were an essential part of surf boats in general and Henry Taft, the Australian manufacturer of life saving equipment, donated life jackets for all power surf boats for many years. 1968 was about the time the time that Warren Mitchell of the Avalon Surf Club came back from England extolling the virtues of using rubber duckies with an outboard motor for rescue in the surf. This provoked a new train of thought because the cost of a rubber duckie was far cheaper than a big inboard surfboat. That same year the ‘Jack Wilson’ group borrowed rubber duckies from ‘Beaufort’ and ‘Dunlop’ and began testing with various horsepowered outboards. In figure 4, can be seen Ken Harbron and Phil Harvey, testing out one such rubber duckie. This particular one was a shovel nosed ‘Beaufort’ with a 25 horsepower ‘Johnson’. It was placed on regular patrols straight away. 4: Ken Harbron and Phil Harvey- The freshwater club's inflatable in action at Harbord. At about the same time John Fallon and Cliff Spong of Soldiers Beach Surf Club also began testing similar configurations. In 1969, John Smith who had been in the original team to produce powered surf boats moved to Sawtell on the North Coast and developed a hard Chine jet craft with a Holden motor which soon took the title of a ‘Smith’ boat. The first to take advantage of this was the Illawarra Branch on the South Coast. A team comprising Col Laughlin (later to receive an O.A.M. ), Keith Dingwell together with the local ‘Lions’ Club, with members from Coledale, Thirroul, Bellambi and Wollongong got together and raised the finances for a towing vehicle and a ‘Smith’ boat (figure 5). Col did the towing and housed everything in his workshop. They were placed on 24 hour callout and when there was a job Col was first called and they accomplished many rescues. Because they were a fair way from Sydney and there were no Marine Police facilities, a police radio was installed in both craft and towing vehicle. This same year saw the first Instruction and Training Manual drawn up for powered surf craft by Don Matheson and John Smith. 1969 saw much development in the rubber duckie now labelled an ‘Inflatable Rescue Boat’ or I.R.B. for short. Although stuck with the tag ‘experimental’, it was put to good use in many places. All the different makes such as ‘Arancia’, ‘Zodiac’, ‘Calegarie’ and ‘Avon’ were being put to the test. We did have driving problems with the I.R.B. the outboard being designed to be operated with the left hand on the tiller (which was also the throttle). The boat could be well balanced from this position, but the powers that be decided in their wisdom, that operators should use their right hand on the tiller and sit on the port side pontoon. This caused many rollovers that became very expensive in the early days, especially with anyone who was used to the throttle action of a motor cycle, the action being the exact opposite. The balance was another factor, when riding in the centre with the left hand on the tiller, the driver could balance the craft, whereas sitting on the portside pontoon with the tiller in the right hand, when the craft tipped towards the driver, he found it very difficult to shift his weight and keep the balance. Also in the recovery of a patient with both driver and crewman on the same side it was again a delicate situation, especially if a small wave struck the starboard side. In 1970, the ‘Jack Wilson’ group came up with a completely new design in the jet boat. The bow was very distinctive like the head of a whale which helped the boat keep the nose down when heading into a large wave. It was also fitted with an inbuilt automatic fire extinguisher system. The craft was also better balanced with a lower centre of gravity. There were hand holds inside and outside the gunwales for both crew and patients to hang on to. (Figure 6). While all this was happening many other clubs were getting into the jetboat bonanza. The ‘Smith’ boat was the more popular. In the Manly Warringah area there were five jet boats on the go now. Shelley Beach (Manly), not to be confused with the Shelley Beach, Central Coast, purchased a ‘Smith’ boat with Noel Daniels and George Somerville (figure 7) so did Dee Why with Bill Gee and Joe Candrik (figure 8), then came Colnarra with Bob Maladay and Tom Whelan, Whale Beach with James McNab. These were followed by North Palm Beach with Tony Burns and Graham Howard. Sydney Branch also got into the picture with their craft at Malabar with Ike Moseley (who was State Superintendent at the time) with Alan Morris (who later became the NSW power craft advisor). In the far north coast, Kevin Morrison and Alan Miles used a privately owned ‘Smith craft’. In 1972, bronze medallions were issued to proven drivers of both JRB’s as well as IRB’s. 1972 also saw the JRB’s commence operations in the Newcastle Branch. Funding was hard, like in most areas, but Mereweather Lions Club provided funding amounting to $4,000.00 to purchase a jet boat for that branch. Veteran lifesavers Laurie March, John Sumpton and John Mitchell formed the first crew. Dixon Park S.L.S.C., were the first to obtain an IRB and by 1975 two other clubs had acquired them. In 1972 Corrimal Leagues Club donated a ‘Smith’ boat to the surf club, Les Nichols and Mark Ryan were to operate it. 1972 saw Kiama Council and a local Holden dealer donate a ‘Smith’ boat to their local club and it was operated by Garry Rodgers and Murray McMillan. Initially most of these craft were labelled experimental but that did not stop them from doing patrols and successfully doing many rescues. 1972 also saw Warrilla Barrack Point purchase a ‘Mutimer’. John Woods was involved. 1973 Thirroul Surf Club ran training classes in rescue and recovery. Bob Green and Dan Mcgroder of Cronulla, Albert Moseley – Malabar, Noel Daniels – Shelley Beach, Ron Fields – Central Coast, Laurie March – Newcastle, Alan Miles – Nambucca, Reg Eggleton and Phil Harvey – Freshwater, were in the initial training group. Photos of several towing vehicles and what was needed to pull the jet boats, compared with the little trailer for duckies which could be man handled. (Figures 9 and 10). One day at Freshwater the jet boat rescued 22 people in 5 minutes when a sand bar washed away. The crowd on the beach sat and stared in amazement. In the crowd was a solicitor from Manly, Jim Florance. When he found out that the group had to raise their own finances, he donated $5,000 on the spot for a new power boat. Arising from this, the ‘Jack Wilson II’ was sold to The Entrance Surf Club on the Central coast. Thereby started boat operations in that area. Arising out of this ‘Jack Wilson III’ was built. In the first instance, it was decided that life jackets should be worn whilst operating power craft as they were in surf rowing boats, but in the case of the IRB, when the driver fell out of the craft, the transverse thrust would push the IRB into left hand circles and when the craft came near to the operator in the water he could not duck out of the way. This caused some injuries so the wearing of a jacket was left up to the operator. Next problem was injuries being caused by the IRB propeller. Several people were injured at Manly Beach and also at Bondi, they were used to just swimming up to the surf boats and they caught their hands etc. in the propellers. Rod Lanker of the ‘Wilson’ group made a propeller guard from ¼” mild steel just like a cage but this took too much performance from the craft (figure 11). So experiments with various ideas took place until 1975, the United Permanent Building Society donated $7,000 to NSW State Centre for the development of a safe propeller guard. This enabled us to go to professional engineers and have them design one. They first made one with protection at the front and back, but the performance loss was too much, so only the front was used successfully. Six of these were made and given to the various clubs for testing. figure 12. The testing was done between two moored buoys and timed with various loads of up to 5 people. United Permanent Propeller Guard Presentations (left to right): Buster Brown (State Centre), Col Laughlin (Thirroul), M. Morgan (Whale Beach), Michael Coleman (Nambucca Heads), John Fallon (Soldiers Beach), Ernie Stephens (Wanda). 1974 IRB’s were introduced to the South Coast Branches. 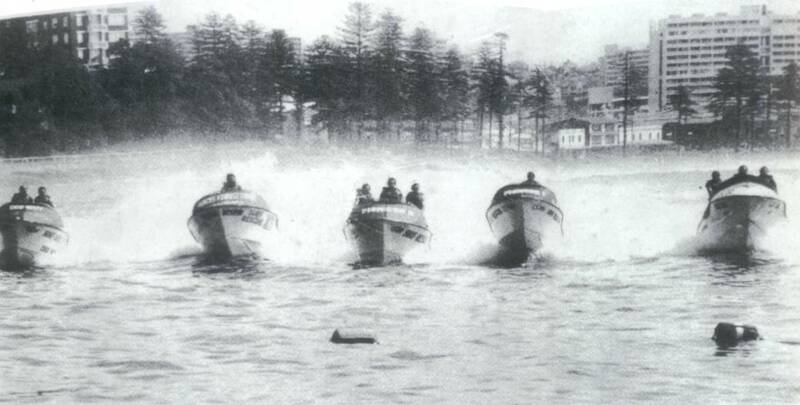 1975 Jet boats were commenced in the Nambucca area by Kevin Morrison and Alan Miles, albeit a borrowed ‘Smith’ boat. 1976, Col Laughlin took over as ‘Power Craft Adviser; to New South Wales. He realised that clubs needed help with their I.R.B’s. They were inexperienced in driving, roll over procedures, and engine maintenance. If nothing was done after a roll over, within a week the motor would be seized up and unable to be repaired. He formed a power craft panel to run an education programme so that clubs could be taught to solve their own problems. He built a purposeful trailer to carry spare parts and equipment especially for outboard motors. The panel was available to the eleven branches, with each being visited twice a year. Club members could pull their own motors down under supervision, and reassemble them with replacement parts on the spot. The panel consisted of four to six members, each visit according to the number of club members to be trained. The panel consisted of Col. Laughlin, Brian Wilson, Jan Cartright, Mike Sawalski, Greg Danvers, Ray McNeil, Barry Rafferty, Bob Cox, Graham Howard, Andrew May, Cliff Spong, Tom Laws and John Fallon. With 118 surf clubs you could see why it too seven years to complete. What a task! 1976 saw Peter Squires of Bondi Club, who was also an outboard mechanic, come into the movement and lend his expertise with mechanical and maintenance problems. This also was when Bob McClelland of Burning Palms came up with the development of a ‘Dory’ type double ender, powered with an outboard, but also carrying oars in case of breakdown in isolated places where there was no back up. Other configurations were also tried. One craft that was successful was the ‘Hydrofield Jaguar’, see fig.13, a Balsa sandwich construction with glass either side. One was put into use at Shelley Beach Manly. It had a triple hull and ran up easily onto a special tyred trailer. Launching from their shed at Shelley Beach could be achieved in all weathers. It really had no need to go right into surfing beaches and it was used extensively where fishermen were washed off the rocks at Manly. 1976 saw Charles Ronalds from Queensland buy the moulds from the Smith and Mutimer jet boats. 1977 saw our first ‘International Power Craft Seminar’ conducted by the Power Craft Panel of State Centre. A team was invited to Australia from New Zealand. They were collected from Brisbane Airport by Col Laughlin OAM, in a borrowed bus. He drove them down the coast, stopping and visiting surf clubs all the way, exchanging ideas, see fig. 14. Of course, the lady in the photo is Mrs Aileen Laughlin, without whom some of Col’s exploits might not have been possible. The New Zealand team were given tours of the various craft manufacturers. They underwent Maritime Testing for our licence qualifications. They were billetted at various clubs on the way. The seminar was conducted at Manly Beach. This started the interchange of ideas across the Tasman. Above 14.: First New Zealand Power craft tour. 1977 - The ‘Jack Wilson 1’ jet boat was taken to England by Don Matheson and John Thompson and presented to the Welsh Surf Life Savers. They spent some time teaching them how to use it and it became the first jet boat in England, used in surf rescue. 1977 also saw much development work in the I.R.B’s. Alistair Walker of the Newport Club designed a hinged floorboard system in the ducks making them quicker and more efficient to assemble. Selection of outboards was simple. In the early days there was mainly only ‘Johnson’ and ‘Evinrude’ available. They were a proven successful motor already with a good back up of spare parts and expertise, best of all they were a much simpler motor to work on. Later there were many that came on the market. 1978, under the leadership of John Fallon, we sent a team to New Zealand, a photo of the team is displayed on Figure 15/16, Men were selected mostly as a reward for their imput into rescue craft development. They visited all beaches where duckies and jet boats were in use to gain further knowledge. 1978 saw Kiama receive their second jet boat which was designed collectively by the members of the State Power Boat Panel, together with Ben Hibkin and Roger Lewis, eliminating the faults of the previous craft and implanting some new ideas. They were on call 24 hours a day. Because of the area around Kiama Harbour, this craft was put to good use and more than justified its existence until it was replaced in 1994. See figure 17. This year saw the development by the Wilson group of a 50 HP Suzuki outboard with a jet unit, glass bottom and rubber ducky top. Very good to handle in rough water, very quick, very good carrying capacity, but in the shallows of a beach edge was a bit hard, it needed a good 6” of water. See figure 18. Another craft tried out was the 21’ ‘Atlantic’ self righting ducky as used by the R.N.L.I. in England, but it was too expensive. 1978, plans were drawn up for a twin inboard jet, but here again – no money. 1978 saw the development of the ‘mini jet’, only marginally successful. 1979 saw a second International team from New Zealand visit for a seminar, conducted at Manly and run by State Centre Power Boat Panel. 1981. After much groundwork by Col Laughlin OAM to convince State Centre of its feasability, we saw the first IRB ducky carnival at Thirroul Surf Club, run by Col Laughlin and his team. This form of carnival was very popular and gained in its intensity. Carnival officials had to be found and some, of course, with mechanical aptitude. Before long, lots of branches were conducting their own carnivals and it was not long before they headed towards State and National Championships. Of course, there were teething problems. Next thing, they had to stop clubs ‘hotting’ up their motors, with scrutineering before and after events. It was the era of development. Some clubs got into strife because of the complaints from members of the public who saw the ducks racing around out in the surf practicing for their races. The public were not to know these men were not just wasting petrol. They were, in fact, putting their time to good use for the day they might be called on to rescue someone where speed was of the essence. It was decided early that any ducky activities and racing should only be done in winter time in areas where there were less people about. 1981. We had the first State IRB Championships Carnival at Soldiers Beach, it was the start and was the first of many. 1982 saw a second International power craft team led by Cliff Spong visit New Zealand. The ideas exchanged were beneficial for team members from both sides of the Tasman. See figure 19/ 20. These ducky carnivals gathered momentum and continued up till about the year 2001 when it was found that insurance costs and other difficulties were too great. They were then stopped altogether. They may be resumed one day, let us wait and see. 1985 The innovation of the rescue helicopter in the Sydney area with its very quick response time just about put the jet boats out of business. When setting up a jet boat or other large power boat it was found that a substantial towing vehicle was required so that the boat could be launched from difficult situations, whether it be soft sand or boggy areas or from steep slippery launching ramps. For example, sand tyres with tread running from back to rear with no cross patterns was the best for sandy situations. Otherwise the tyre just dug itself into the sand. The trailer also has to be a sturdy one, preferably with a good recovery winch, or else have the winch mounted in or on the towing vehicle. So the exercise cannot be entered into lightly. There is a large expense involved which also has to be maintained. As can be seen in the photos, a trailer for an IRB need only be of light construction and can usually be manhandled on the beach. In the past, some clubs did not realise the expense involved and found it was great to get a boat donated, but then there was the cost of all the ancilliary equipment, as well as the on-going costs of it all. When things are working in a saltwater environment it gets very expensive and that is what put some clubs out of business. It helped some surf clubs tremendously when Dollar for Dollar came in and they only had to raise half the cost of the craft. Instead of having to keep the craft till it was well and truly worn out, they were able to sell while it was still worth something, thereby helping with the cost of the next one. It actually became self-funding. Once IRB’s became well and truly accepted they were able to do away with the olde ‘Reel, Line and Belt’. That was, of course, if they had a proficient IRB driver on each rostered patrol. 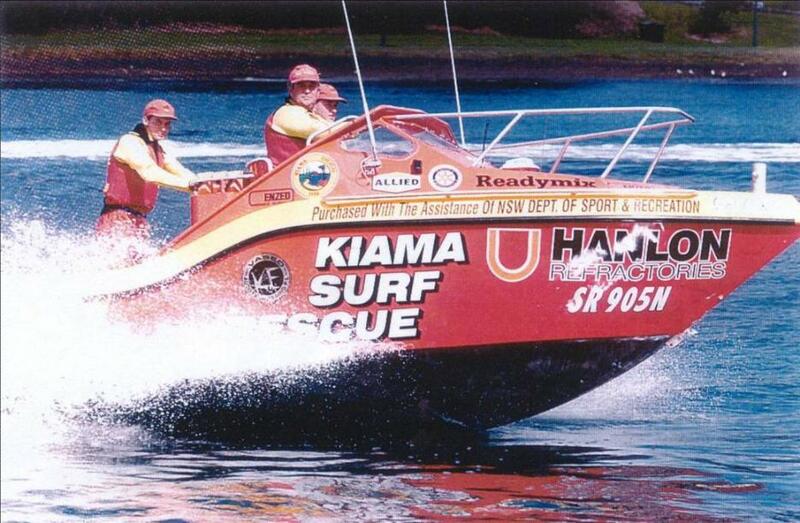 The latest jet surf boat and the only one still working in New South Wales is stationed at Kiama on the south coast. Their present boat is their third. It was built in 1994, it has an Australian ‘Doen’ jet unit and a ‘Yanmar’ diesel. It has given great service and is still justifying its existence by doing numerous rescues all the year round. It is interesting to note that their first jet boat coast $4,000, whereas the current boat cost $130,000, ten years ago and is still going strong. See figure 26. In 1985, Don Matheson BEM, passed away, and in 2002, Peter Dawson OAM also passed away. Their efforts were not in vain. Thanks must also go to Mrs Betty Bailey who compiled these notes and photographs. Copyright Roper Lars Scott Brown (Buster), 2014.